TV show dates: July 11, 2018 — present. Performers include: Kevin Hart (host). 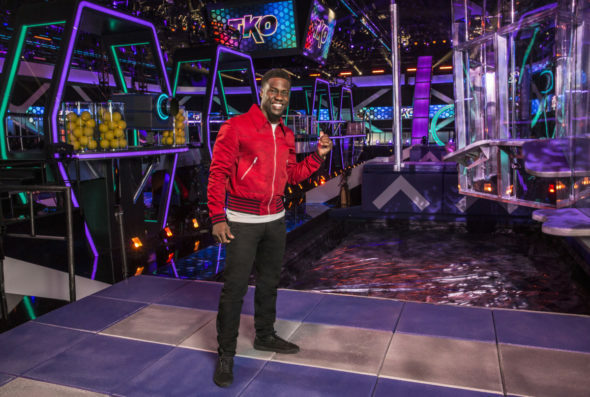 The TKO: Total Knock Out TV show is an obstacle course competition from executive producers Mark Burnett, Barry Poznick, Kevin Hart, Holly Wofford, and Jane Y. Mun. Hart also serves as host on the unscripted reality TV series, which features players from all walks of life. As one contestant races through the obstacle course, the competitors man battle stations along the way. From there, they fire projectiles, in an attempt to knock the racer off of the course and slow his or her progress. Although the competition is physical, it’s also funny, and includes plenty of “us versus them” scenarios. The racer to complete the course in the shortest time is awarded a cash prize. What do you think? Do you like the TKO: Total Knock Out TV series? Should this CBS TV show be cancelled or renewed for another season? TKO: Total Knock Out: Is the CBS TV Show Cancelled or Renewed for Season Two? I love this show and hope that it will be renewed. When will CBS show some mercy (to its viewers) and cancel that Kevin Hart-hosted gutterball, TKO: Total Knock Out?! Each week, it hemorrhages more and more viewers (losing 1.63 million viewers since it debuted six weeks ago). The network took a gamble on someone clearly “an acquired taste”, but it’s time to cut their losses and let that shrill entertainer return to the stand-up and features his paying fans enjoy, and give the rest of us (what’s left of) our hearing back! My boyfriend & I love this show. Love Kevin Hart he is so funny. Glad it is not a total non comedian jock. Also we really like that you are having 1 reality show contestants. Keep up the great show. Just like the first show they put a black athlete against 4 wimpy ordinary people. Oh no this game is not rigged.